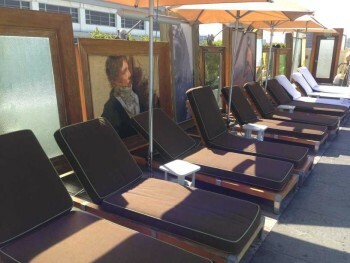 Review of the SLS Hotel at Beverly Hills – a good LA redemption with no car? Earlier this month I (Anika, not Rob) spent a week in Los Angeles. It was my first visit and as I wanted to see as many places as possible – without renting a car, which is virtually a necessity there – I decided to hotel hop. I also used Airbnb for the first time, more on that coming soon. 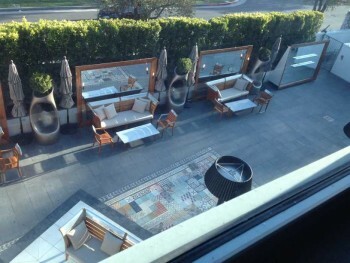 This is my review of SLS Hotel at Beverly Hills, part of Starwood’s The Luxury Collection, which was my first stop. It was recommended to me, along with the Beverly Hilton nearby, as one of the better Los Angeles hotel options if you want somewhere with nearby walkable attractions. It also has a free chauffeur service which will drive you anywhere within a 2 mile radius. The hotel was booked as a Starwood Preferred Guest redemption at 20,000 points per night. 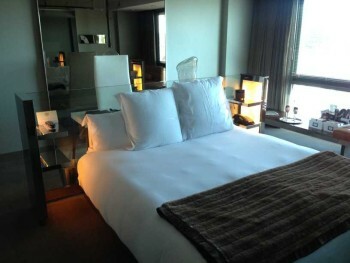 From the pictures on the website I got the impression that this 5 star hotel was lovely, modern and bright. Not true. When I arrived I realised that it was actually pretty dark. When I mentioned this to the concierge (which was my European attempt at small talk) I only got a confused look and the explanation that this hotel was obviously a boutique property. OK …. Here is the lobby which actually looks a bit brighter in this picture than it actually was. Getting out of the lift I came across a pool table, which didn’t look like you could actually play on it, a chair illustrated with a dog dressed in a suit (you didn’t misread that last phrase) and a billboard-like illuminated poster. The inscription on the pool table? I personally wasn’t too impressed by my room. It was too dark, had too many mirrors and seemed a bit … well … boring. The room had no ceiling lamp and only small side lights throughout the space. The bed, at least, was very comfortable. The desk was a decent size but most of the time it was too dark to work. There was only one plug socket by the desk as the other two were taken up for the lamp and telephone. As all of the sockets in the room were standard US type and there was no powered USB socket you will need an adapter (there is one for purchase in the mini bar box). Standard internet was free for up to three devices, but with a speed cap of 2 Mbps extremely slow. Watching Netflix was almost impossible unless you were very patient. Premium internet at 12 Mbps costs $5.99 per day and can be used with up to four devices. If you want to do any serious downloads then you will need to pay this. – because we all want to see the bed when we brush our teeth, right? 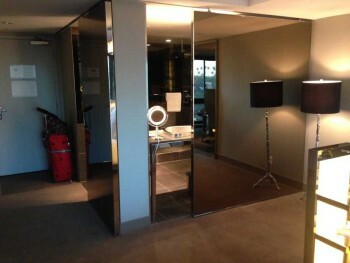 It isn’t easy taking a photograph of a bathroom when all four walls are partly mirrored …. The toileries were branded Ciel (the hotel’s spa) and had a subtle smell. 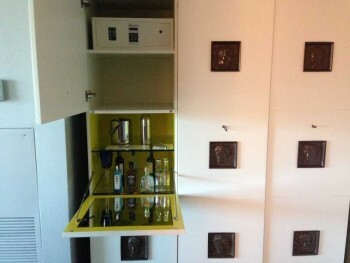 The wardrobe was also home to the minibar and a safe. 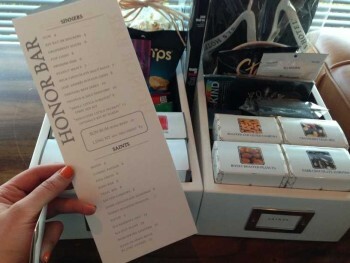 Minibar snacks were divided into two groups: ‘saints’ and ‘sinners’. An interesting idea, although how hotel flip flops fall into the ‘saints’ category is beyond me. The room had no coffee machine and not even a kettle. French press coffee on the room service menu was $10. My window was facing one of the outdoor areas, which looked lovely but was strangely deserted throughout my stay. 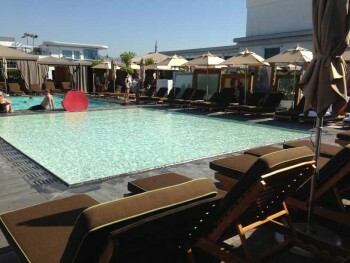 The Altitude pool at SLS Beverly Hills was very popular as the weather was amazing. I had to snap a picture without the crowds early in the morning as it got busy very quickly. There is lots of artwork surrounding the pool area and bar. As people can reserve a cabana and the surrounding deckchairs it was a bit of a pain finding a free deckchair after lunch. The pool boy wasn’t too friendly in the way he told me that my chosen chair had been reserved and he didn’t make it clear where I could sit instead. Each afternoon on the weekend a DJ played from 2pm-6pm which gave the area a pleasant lounge atmosphere. This is the entrance hall of the Ciel spa and the gym. Unlike most hotels I’ve stayed in recently the SLS Hotel at Beverly Hills gym was constantly full of people and I couldn’t take a picture. It was a generous size with all the key equipment you would want. 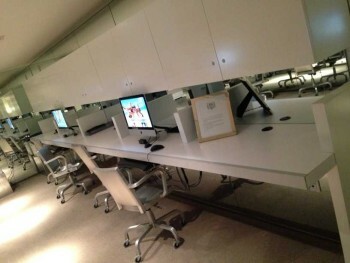 The hotel also has a work area with computers and printers. I didn’t go to any of the hotel restaurants – the Saam, the Bazaar and the Tres. Bazaar appeared to very popular with local residents when I took a look. If you want a Los Angeles hotel which has a few sightseeing options within striking distance, the SLS Hotel at Beverly Hills is worth a look. 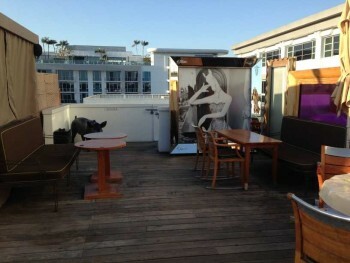 It is located just 2 miles from the upmarket shopping enclave of Rodeo Drive. The hotel offers a free chauffeur service within a 2 mile radius so you can survive without a car when staying here for a couple of days. There is also a great farmers market not too far from the hotel and a shopping centre just around the corner. All the concierges were extremely friendly and helpful and even found a church for me to go to. The rooftop pool and bar are a great place to relax in the sun and have a cocktail. 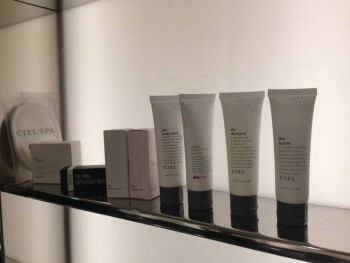 There are a lot of positive reasons to stay at the SLS Hotel at Beverly Hills. 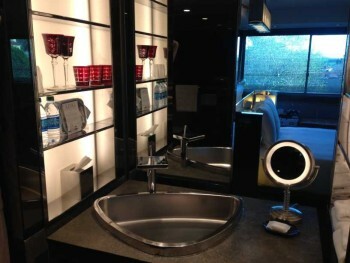 Personally, I struggled with all of the mirrors in the room and the low lighting which is prevalent throughout the hotel. Apart from that, this is a good Starwood option and a decent redemption, given their usual prices of around $400 plus tax, at 20,000 SPG points per night. You can find out more information on the hotel, and book, on its website here. I was only aware of SLS in South Beach Miami until reading this review. I had the same impression there also – reminds me walking into a Hollister or Abercrombie store. Watch LA Story, with Steve Martin. The artwork will then make sense. It’s LA! 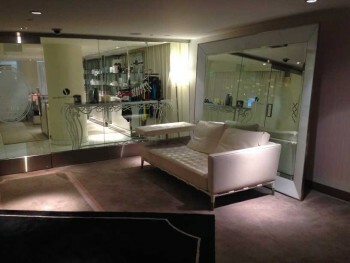 The Sofitel around the corner is also really dark in the reception/restaurant bar area. I think they design them to be like nightclubs in LA. Although the rooms were nice and bright. Anika, did you get the 7 day bus/metro pass for $25, we found that an excellent and very cheap way to get around. The services were very regular (well until about 8pm) and the area around the Beverly Center/Sofitel has buses going in every direction. The is also a app for tracking the buses and bus stops which worked well (using Three’s Like Home for inclusive data!) Easy to get to Downtown, Universal, Santa Monica etc. We arrived quicker than our friends in a car a few times when they have to find parking, pay for parking, tipping for hotel parking, waiting for your car to come back etc. We also found the Go Pass great value for getting to see lots of attractions that we would not have normally visited – Peterson Car museum, Hollywood museum, Madame Tussauds, Universal, La Brea tar pits, Hollywood and Malibu homes tours, Santa Monica pier, bike hire and many more (although the prices seem to have gone up in the last couple of years). Sofitel is good, but very small pool! I prefer the IHC at Century City, it overlooks Fox studios and has some great rooms and for the same money as the SLS you’d get a better room! It’s not too far from public transport links to get around! Agreed, the pool was really disappointing, and with lots of traffic around. I visited in Feb a couple of years so was only just about warm enough to go in the pool, In spring/summer would look for a hotel with a better pool. 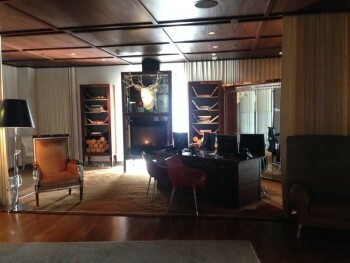 A good non-car budget redemption option for LA (if you HAVE to do LA), is the HIX hollywood. It’s a 10 min walk to Manns Chinese theatre and hollywood Blvd. @ 40K points it isn’t cheap, but the same night goes for around $300, so in that regard, not bad. It’s all about location. I find it baffling that after paying $400+/night they still can’t offer you proper internet or power adapters for free. How was the chauffeur service (given the title of the review!)? Thanks for the review. I find it also a pretty decent value SPG redemption – which is quite unusual for a SPG cat 6 if you ask me. Very good tapas restaurant by José Andrés and the roof top pool is fantastic. Phillippe Starck (the guy who made the bizarre horse-with-a-lamp-shade-on-its-head outside the BA lounge at LHR T5) designed the whole place so it’s clearly quite quirky.. Pretty good for celebrity spotting if you are into that sort of thing (it was featured in one of the latter seasons of Entourage..). 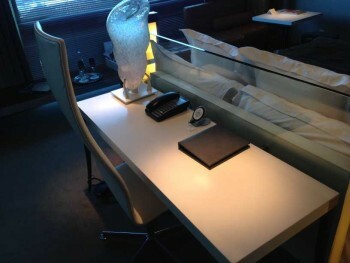 Can’t see myself heading to LA any time soon, but this seems like a pretty decent hotel, not sure about the head of the bed butting up against a glass wall that forms part of the desk though! Fo us HIX mortals…this place would only work if you were looking for a car-less stay as you say… Its very pricey and I would struggle to justify the rates…. You will miss a lot of LA without a car unfortunately…. A generic concierge and parking in hotels in USA question. I have an upcoming trip to the west coast of America including a number of nights in LA. My previous trips to the west coast have given me the impression that nobody in the service industry does anything without expecting a tip. I have quite a few nights booked at hotels whereby valet parking is compulsory which comes with the fees attached. Am I expected to tip the attendants every time I have my car brought to the entrance or once at the end of my stay. If so, how much is the norm and should I give a tip anyway as I am paying for the valet parking in my hotel fees ? In addition, I have never used the services of a concierge in the past, except for directions for somewhere. If, however, I did get a concierge to book a restaurant or tickets for a theatre am I expected to tip him/her at the end of my stay or does it come as part of their role as a paid concierge at the hotel ? It’s the US, the answer is surely yes! It’s the US. A good hotel doorman in New York makes $100,000 a year, almost all tips. Luckily most know by now that British people usually don’t so you have an excuse. You will find in restaurants that if they realise you are British you will get handwritten instructions on your bill telling you what to tip! Including ludicrous 20% suggestions for mediocre service! A small number of NYC restaurants are starting to see the light though, was a good Freakonomics Radio podcast about it a month or so ago. I was told that waiting staff in the US are taxed on the assumption that they will receive a certain level of tips on the value of bills they serve, supposedly to prevent them hiding cash tips, so if you don’t tip you are effectively making them pay to serve you. 20% is standard for good service, 15% for average, 10% baseline. People who aren’t comfortable with this shouldn’t eat out. But the problem is that the service is often mediocre (is that ‘baseline’?) but they get annoyed if they don’t get 20%+ – so the system clearly isn’t doing what it is designed to do, reward good service. Even more ludicrous is some of the setups (e.g. airport shared ride bookings) that ask you in advance what tip you want to give, before you’ve even had the service!! The amount being earned in an average restaurant for the number of covers per night at 20% tips is ludicrous for waiting tables, sorry – especially as they’re expecting it on everything. Why should a very expensive bottle of wine be worth a higher tip than a cheaper one?! Interestingly I overheard some young Americans when in Oz who were amazed and delighted at the lack of need to tip (and I must say the general standard of service was far far better) – hopefully the tide is starting to turn! If they get annoyed about not receiving a 20% tip then they have the wrong attitude to deserve a 20%, if visit the US I think a 10% minimum tip should always be considered when eating out. I am glad that UK restaurants don’t make such a big deal about tips and we can leave a tip depending on how we feel that we were treated. I couldn’t agree more Alan. Poor service certainly shouldn’t be rewarded. Only last weekend (in the UK) I asked for a ‘suggested service charge’ to be removed from the bill due to poor service. Would anybody ever tip the Tesco/ Sainsbury etc guys who deliver your online shopping? I was in Vegas two years ago and we were asked whether we wanted to tip the helicopter pilots taking us to Grand Canyon and back. I thought pilots were well paid. I thought I had seen it all…..